In Exercise of the powers conferred by Central Government vide notification No. S.O. 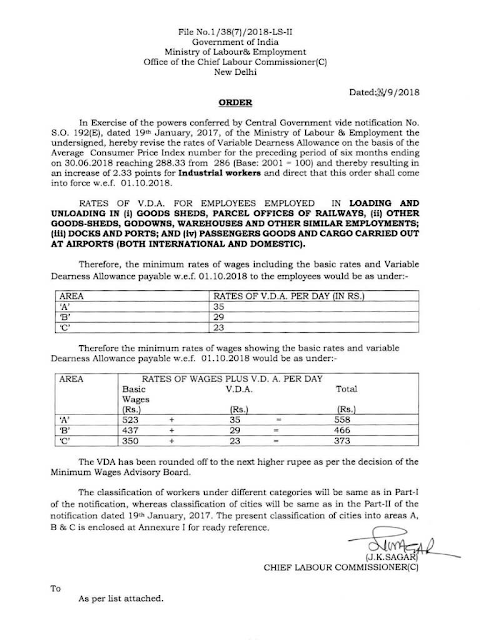 192(E), dated 19th January, 2017, of the Ministry of Labour & Employment the undersigned, hereby revise the rates of Variable Dearness Allowance on the basis of the Average Consumer Price Index number for the preceding period of six months ending on 30.06.2018 reaching 288.33 from 286 (Base: 2001 = 100) and thereby resulting in an increase of 2.33 points for Industrial workers and direct that this order shall come into force w.e.f. 01.10.2018. The Classification of workers under different categories will be same as in Part-l of the notification, whereas classification of cities will be same as in the Part-II of the notification dated 19th January, 2017. The present classification of cities into areas A, B & C is enclosed at Annexure I for ready reference.